In this report, you will learn the tactics that I have been using to gain 30+ customers in 90 days. Whilst the market I serve (IT & MSP business owners) is somewhat different to my readers I thought it’s definitely worth producing this report to give you all some insight to what is possible by posting a video almost every day to Facebook of all places. Originally set up as an MSP I pivoted the business to help other MSP and IT business owners. This pivot came into full effect on January 1st 2019. I’ve published a book in 2018 (Bear Attack SEO) in anticipation of the pivot which at the time was going to be SEO services for MSP’s. However, this quickly changed when I realised this model was flawed. I would have just been another marketing agency catering to a niche vertical in this case MSPs. I certainly did not want to be running a marketing agency. With this in mind, I had to have a hard think about the business I wanted to build. This came back to a talk I watched on youtube by a guy called Frank Kern. The title is called Core Influence. What this boils down to is imagining your perfect day – what you really want to get out of life – than constructing a business around how that day can become a reality. I won’t bore you with the detail on what that day looks like but will tell you this exercise is definitely worth doing. There’s also a similar book on the subject called “Think Your Way to Success” by Mark Rhodes. 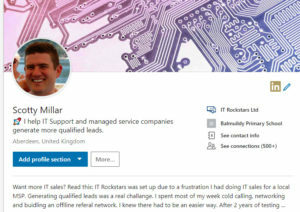 At the time I was not entirely sure what my service would be but I knew I needed to start networking and forming relationships in the area of the IT Channel. I quickly set up a list of names I knew of that had an internet presence and had been on the scene for some time. My strategy was to interview these people on my Youtube channel which has the biggest following. As of today 7th of April 2019 I’ve interviewed almost everyone on the list. I think this is a great achievement in itself. With the interviews in place, I had formed the initial start of some form of online relationship with these “influencers”. There have been other guests on the show and back in October one of them gave me the idea for my service. Now I’m not going to name names here – I will leave that for a follow-up interview but all I’ll say is that imitation is the sincerest form of flattery. The service is now fully up and running as of January 1st. We provide white label content for IT businesses – at its core, we help IT Businesses market their business by producing content they can post up to their social feeds as if it were their own. The main funnel I’ve been using for sales of the service is the homepage at www.itrockstars.co.uk I spent a couple of hours copyrighting this page. Things like an instant clarity headline and conveying exactly what the service was that we offered is very important on any landing page. The page itself has a conversion rate of over 10% which is extremely high. That basically means that for every 10 people that visit the page 1 of then will eventually sign up for the one month free trial of our service. I use the word “eventually” as the sales & marketing process is done over on facebook of all places. Anyone that lands on the front page are retargeted with a series of Facebook videos. There are a few steps to the process with most people coming from LinkedIn to my homepage then being re-targeted with the Facebook videos. The video’s themselves are an attempt to add value to the market place. Every single one of the video’s purpose is to help an IT business owner in somewhat with practical advice they can use in their business today. I do of course mention the IT Rockstars service but keep this to a minimum so the videos are defiantly not a sales video. Most of this profit is currently being reinvested into testing advertising campaigns. I must also mention that this is my side hustle – I do hold down a full time “j.o.b”. My goal was 10 customers by March 31st which I’ve blown away – the figure is almost 4 times bigger. This actually fills me with a sense of dread as it’s quite a high target number which I’m now responsible to hit in the next quarter. I’ll beat myself up about this if I don’t reach 60 signups by July 1st. The other negative thought I have in my mind and one which has me thinking hard is the churn rate. I’m as guilty as the next person when it comes to trying things out on the internet then cancelling the service. This is mainly due to the fact I don’t stick with things. The service we offer takes time – 12 months minimum is recommended however customers can cancel anytime – even in the free trial period. No risk to potential customers but all the risk is now on IT Rockstars to deliver. Whilst I don’t have any problem with delivering I do feel an annual approach, a 12-month package would be better placed to deliver results. Anyway down to the actual approach I’ve been using to get customers. January was all about Facebook. I targeted a number of Facebook Groups with my daily videos – I shared a video with a different group each day. I repeated sharing for about 3 weeks. This I believe was my main source of signups in January however I did not want to appear as spamming the group so no longer share my videos unless it’s of something of importance. February and March have been about pure LinkedIn contact requests. I’m quite lucky as I know my target audience. This is males aged 30-55 that run IT/MSP businesses. Very easy to find those types of people on LinkedIn. I started with 20 connection requests per day. This was on a secondary profile to my personal LinkedIn profile. My connection request rate is around 75% acceptance – I don’t send a message when connecting. Whilst many people may say this is like running up to someone with your business card and walking away the alternative is crafting a personal message which I personally think is a bit spammy. Whatever your view here 75% acceptance is good. The profile is currently sitting at around 720 connections which are mainly UK based. When I post out to this profile I’m getting some surprising figures. Text performs better than video. Videos are only getting around 70-90 views. My guess is that most people are seeing videos whilst in the office and don’t want to turn up the sound – this is just a guess. When someone visits the site I re-target them with a Facebook tracking pixel. We’ve got two buckets here – a cold audience (the people that visit the website) – they are shown 5 videos over the course of a few days. If they watch 25% of any of these videos I add them to a warm audience. Facebook is currently the only platform that allows you to target customer based on who engaged they have been with your videos. This is a very powerful feature that hardly any one knows about. It’s a bit like having a big email list but people actually open the emails. 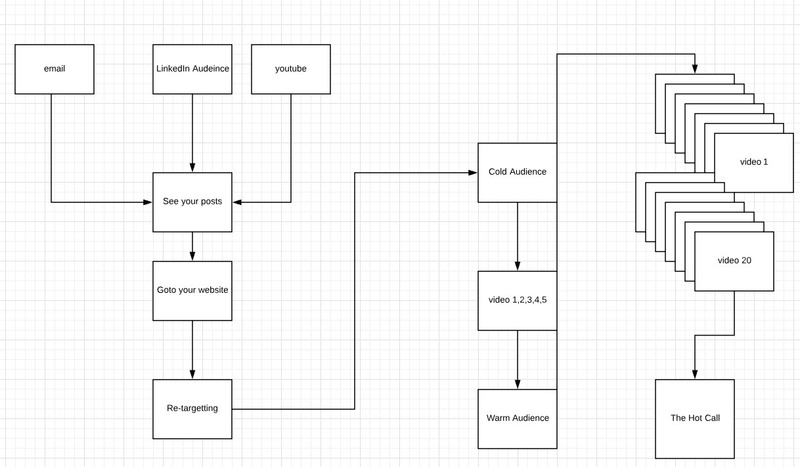 This warm audience bucket is set up to deliver 20-30 videos over the course of a number of weeks. This approach is still in testing. What I would say at the time of writing is that the paid approach has probably led to around 10 sign-ups. However, the organic effect has been much more significant. This whole funnel can be used in any business – I am planning to develop some content and training classes around this process for IT Rockstar customers. If you would like to be notified of when this is ready then, please like+follow the IT Rockstars Facebook page. Great list of folks on the list, thanks for having me and I hope other entrepreneurs learn from your ideas Scott!